Want to have some fun at your next party? If so this is the t-shirt for you. A shirt that looks like a tuxedo that is what this is. All black with a fake white shirt inside and a fake black tie. This is such a funny shirt that can be used for all kind of fun and gags or just to wear everyday. 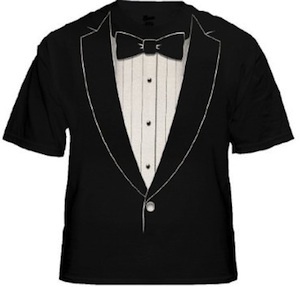 Go see if you like to wear a Tuxedo T-Shirt. Summer is here and that means tank tops are the thing to wear. 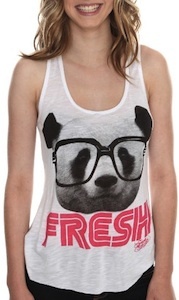 This tank top shows a panda wearing glasses and the word FRESH below it. A great shirt for summer and for any where actually. Enjoy the weather and be superfresh with this Fresh Panda Tank Top. 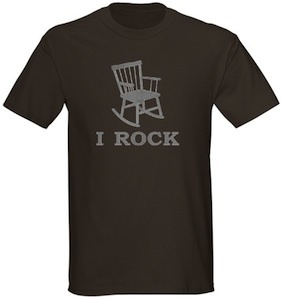 You know you are rocking and that is why you just need a t-shirt like this that says “I Rock” and shows a rocking chair. Of course if you really want to show the world how much you rock you don’t want a dull colored t-shirt so that is why you can also get this t-shirt in flashy colors. Show the world how much you rock with this I Rock T-Shirt. This t-shirt is just funny and yes comes in different styles and colors and even jerseys and all kind of other stuff. And of course the hippo smiles and looks cute. 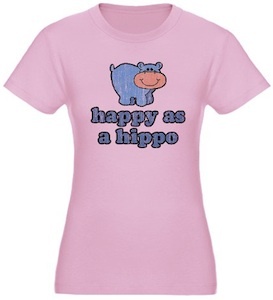 Check out all the Happy As A Hippo T-Shirts. This little Stickman loves his garden and he grows all kind of flowers and vegetables. 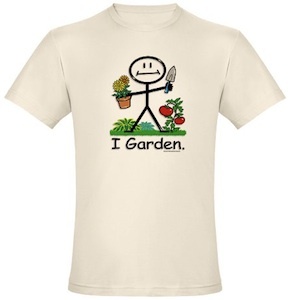 On this t-shirt the stickman looks real happy and love to share his feeling about gardening with who ever stares at the shirt while you wear it. The shown t-shirt is made of 100% organic cotton so if you prefer that then this is the shirt for you. If you don’t care about the organic part then no worries there are lots of different styles available of this i Garden t-shirt. Have a look at this Stickman I Garden T-Shirt. 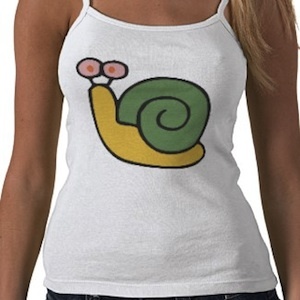 A shirt with a silly looking snail that is what you see. And before we go any further yes this is a spaghetti top but it also comes in tank top or normal t-shirt for basically any body in your family and in different colors to. Lets get back to the little snail. He is trying to crawl around but he is not going anywhere soon. He looks silly with eyes on sticks and a yellow body with a green little house on his back. Check out all the Silly Snail T-Shirt’s. A polar bear t-shirt that is what you should own because before we know it those big white bears are all gone. 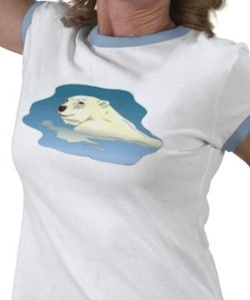 This t-shirt shows a polar bear taking a swim with water surrounding him. And yes this shirt comes in boy, girls, husband and wife’s styles so just choose what you want to wear and the cute polar bear can be on it. Wait no longer and go get your own Polar Bear T-Shirt. 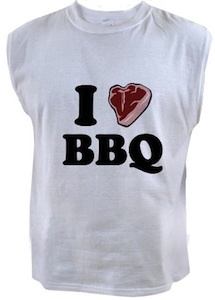 This is a t-shirt for a real men, a sleeveless t-shirt that says “I Love BBQ” but instead of a heart it shows a nice juicy steak ready to be grilled. A must have shirt for summer when the BBQ is the main source of cooking. BBQ fans are gone love it when you give them this shirt as a gift. Move on an go get your men a I Love BBQ Sleeveless T-Shirt. A red t-shirt takes some guts to wear but for sure you can do it. 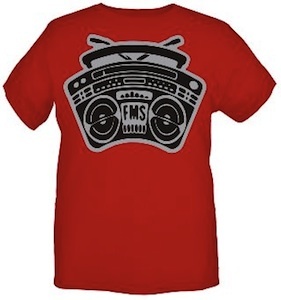 This red t-shirt shows a big stereo with the letters FMS in the middle. If you need some music in your life then why not get this Red The Noise T-Shirt. Fathers day reminds you every year how lucky you are with such a special dad. Remember when he took you fishing when you where a kid? and if you look closely you see you and your dad standing in the first D with you fishing gear. This must be the best Fathers Day gift you can give you dad this year. 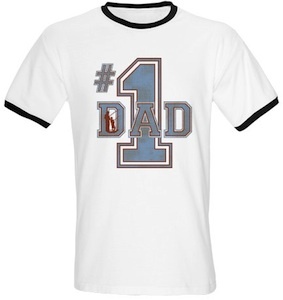 Have a better look at this #1 Dad Fathers Day T-Shirt.